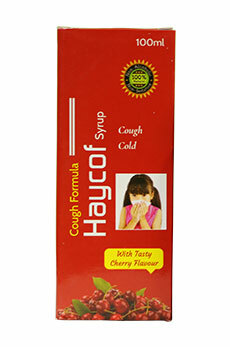 Haycof is a herbal cough formula for quick and safe relief from cough. It treats the root cause; combats with respiratory pathogens and inflammation. Improves immunity, controls allergic reactions, and provides complete relief from cough. It helps to dissolve & expel congested phlegm, provides soothing effect on the throat. This sweet tasting cherry flavored syrup is non-sedative. It doesn’t cause drowsiness, hence can be given to school going children and to working people. 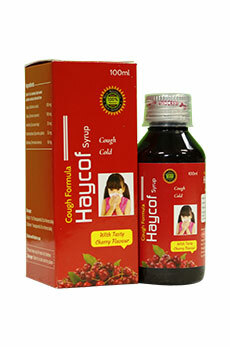 Haycof is a herbal cough formula for quick and safe relief from cough. It treats the root cause; combats with respiratory pathogens and inflammation. 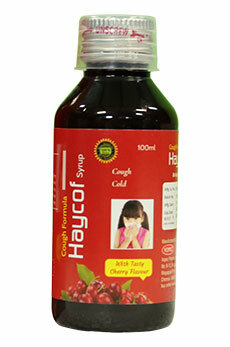 Improves immunity, controls allergic reactions, and provides complete relief from cough. It helps to dissolve & expel congested phlegm, provides soothing effect on the throat. This sweet tasting cherry flavored syrup is non-sedative. It doesn’t cause drowsiness, hence can be given to school going children and to working people. It is free from alcohol and side effects of anti-histamines. 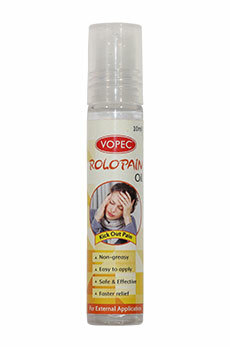 5 to 10 ml twice daily after food or as directed by the Physician. Antitussive: Reduces Cough Anti-inflammatory: Reduces respiratory tract inflammations Expectorant: Removes blocked phlegm from lungs Demulcent: Soothes the respiratory tract. Food and drinks should be taken in warm state. Avoid going outside in evenings and windy areas and smoky places. Practice Pranayama to make your lung healthy and to improve your breathing quality. Vaasa(Adathoda vasica) It is an anti-allergic and anti-tussive herb controls cough and reduces allergic reactions in respiratory tract. Tulasi(Ocimum sanctum) contains antitussive, antimicrobial activity, removes toxic accumulations and improves immunity against respiratory pathogens and allergens . Haridra(Curcuma longa) possess anti-inflammatory, anti-bacterial and antioxidant effects . Curcumin is a major component in Curcuma longa L., being responsible for its biological actions. Curcumin exhibits antispasmodic and anti-inflammatory actions; and also inhibits carcinogenesis. Yastimadhu(Glycirrhiza glabra) Liquorice is an anti-inflammatory herb forms a protective layer over the respiratory tract mucosa and clears irritation. Bihitaki(Terminalia bellerica) It is an antioxidant herb, also shows anti-allergic, Anti-inflammatory , Antimicrobial activity and reduces Cough. Sandeep Dhankhar, Ramanjeet Kaur, S. Ruhil M. Balhara, Seema Dhankhar and A. K. Chhillar-A review on Justicia adhatoda: A potential source of natural medicine.